Home › CLI Updates › It’s Unanimous! These were just a few of several questions the five Woodburn Public Art Mural committee members were inquiring from their very first applicant—The CAPACES Leadership Institute. Last Wednesday, the Woodburn Public Art Mural Committee unanimously approved the CAPACES Leadership Institute’s application for a mural designed by muralist Juanishi Orosco. Representing the submitted application was lead mural organizer Dalila Ortiz, who was also joined by CLI Special Project coordinator Jaime Arredondo, CLI executive director Laura Isiordia for the CAPACES Leadership Institute, and forty-plus supporters in attendance. Despite some concerns from a few committee and community members, the mural committee unanimously approved the CLI’s application citing the “thorough preparation” of the CLI staff and the lead muralist. The approval of the CLI’s mural application officially designates the CLI Mural as the first publicly approved outdoor mural for the city of Woodburn. The passage of the mural contrasts past efforts from PCUN, the CLI’s sister organization, in their push to establish affordable farmworker housing units in the 90’s. “We were forced with a lot of resistance. I remember one city councilor asking us ‘Why don’t you just go home!’” recalled CLI Executive Director Laura Isiordia. 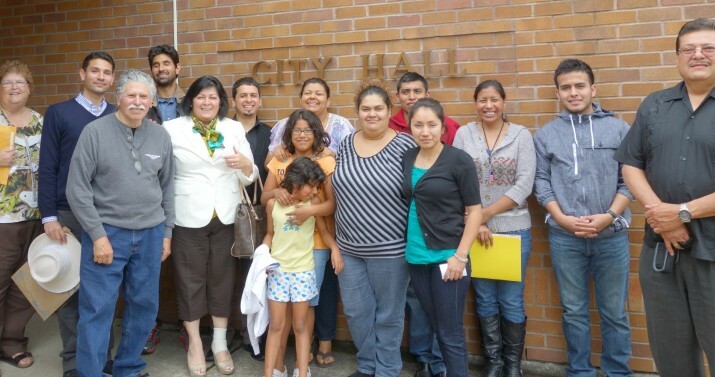 This time around however, the city applauded the efforts of the CLI and the farmworker movement led by PCUN, for championing a mural ordinance, “Where here because of you [CAPACES Leadership Institute] and your efforts to pass a mural ordinance. To leave here without granting you a right to paint would be an injustice,” commented one city council member who sits on the Public Mural Committee. “The acceptance of our mural application is victory shared by the community. This victory signifies that we matter, that farmworker Latino community is an important member of this community. It also means that when we unite together in the “Si Se Puede” spirit, we demonstrate the political power that we possess,” remarked Laura Isiordia after the committee’s decision. What does this mean for the lead muralist Juanishi Orosco? “I think the board’s approval has a very positive impact in the community in that it will open doors for other aspiring muralists.” said Juanishi Orosco. Front side of proposed mural design. Mural painting will kick-off on Saturday, July 13th. Although there is still some preliminary work, the CLI has set Saturday, July 13th as the official kick off date for the mural painting. July 13th also happens to be the Leadership Institute’s second birthday! For those interested to volunteer in painting the mural, contact Dalila Ortiz at dalilao@capacesleadership.org or (503)902-0756 Ext 5. For those interested in making a donation click here! So far we’ve raised $2,800 of the $5,000 fundraising goal for the mural this summer. A 100% of staff and board have also pledged to donate, will you join us?